Anan comes from an illustrious lineage, the four decade old corporate Sharp Pumps. Among the most prominent names associated with domestic and agricultural water pumps, sharp has always strived to reach out beyond business as well. Education has remained a key element of its socially responsible endeavors, from education & support to children with challenges and basic education to rural children to employment – oriented technical education. As an initiative of Sharp, Anan draws from its parent company’s passion for education to deliver a holistic learning platform for children. Moreover, children who have had the opportunity to be a part of a high learning environment demonstrate positive developmental gains when compared to their peers. It is this fundamental understanding that drives us to extend a one-of-its kind environ that fosters every child’s holistic development across multi domains. 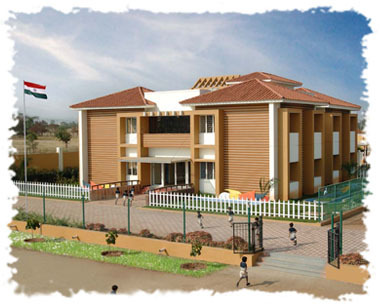 Sprawled over an extensive area of 6 acres, we offer theme-based learning spaces at the Kindergarten and Primary levels (CBSE Syllabus) with the endeavor to make education precisely what it should be – enriching, enlightening and enjoyable.